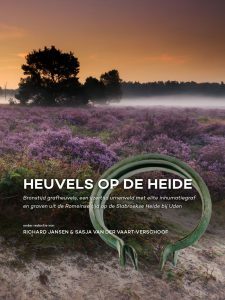 In 2005 and 2010 the Faculty of Archaeology and Archol BV excavated an urnfield known as Uden-Slabroek, which had already been explored in 1923 by A.E. Remouchamps. An exceptional burial found here, known both as the princess grave of Slabroek, was identified as an Early Iron Age elite burial and was incorporated into my PhD project. I collaborated closely with Quentin Bourgeois and Richard Jansen to analyze this exceptional burial, which is published in several articles. At present I am collaborating with Richard Jansen and the municipality of Oss to publish the excavation report as whole of several excavation campaigns conducted on the Uden-Slabroek heath, which will be published by Sidestone Press in 2018. The following is an English summary of this upcoming volume, which will be published in Dutch. Some 3000 to 3500 years ago a number of barrows were erected in an area now known as the Slabroekse Heide (Uden, N.-Br.). In the following centuries people were regularly buried here, and between circa 800 and 500 BC a small urnfield evolved with several hundred small mounds on the heath. These burial monuments covered the cremated remains of the dead, which were generally buried in urns. A unique inhumation burial in which a man or woman was interred lying on his or her back in a small chamber carefully constructed from charred oak beams also dates from this period. Here the deceased was dressed in a colorful dress with long sleeves and wore metal rings in her hair. Extraordinary bronze bracelets and anklets adorned the limbs, and pins and toiletries were interred as grave goods. Several centuries later, during the Roman Age, the cemetery was once again used as a place of burial. Following this, the area went out of use, and the dead buried here were slowly lost to time. In the late Middle Ages a so-called landweer was constructed, running straight through the cemetery and marking the border between the vrije heerlijkheid Ravenstein and the dukedom Brabant. In the 1950s the mounds were removed from the landscape and the area was taken into use as an agricultural field. But this is not where the story ends – in 2003 Staatsbosbeheer took ownership of the land and following the excavation in 2010 the Slabroekse Heide cemetery was (re)constructed. Today the area is part of the nature reserve the Maashort and accessible for recreational use, and contributes to the primal feeling that this regions wants to evoke. This book presents the results of three excavation campaigns conducted at this special place. In 1923, Remouchamps of the National Museum of Antiquities explored this area. In 2005 and 2010 the Faculty of Archaeology and Archol bv further researcherd this cemetery using modern techniques, which allow us to reconstruct the use of the cemetery and the special inhumation funerary ritual in detail, thereby bringing these mounds on the heath back to life.